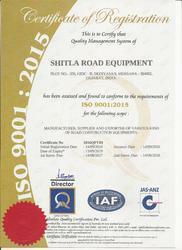 Established in the year 1999, Shitla Road Equipment [Mehsana] are considered amongst the prominent manufacturer and exporter of Road Equipments. Our offered products include Asphalt Drum Mixing Plant, Hot Mix Plants, Batch Mix Plant and much more. Our road construction equipment has gained a wide acclamation for its quality standards, high performance, sturdiness and longer functional life. Under the visionary guidance of our Manager, Mr. Sanjay Suthar, we have attained a formidable position in the market. His vast industry experience, detailed knowledge, and constant motivation have enabled us to create a niche for ourselves in the highly competitive market. Since our inception, we have been a client-centric organization. Our rich understanding of markets and industry knowledge has given us the advantage to support the product demands of our clients in every possible manner. All our efforts are targeted towards providing complete satisfaction to our valued clients. We understand the value of the money invested by them and we make sure that they get the best deal in the market. We are a professionally managed company and our commitment to offer world-class products have given us an enviable position in the industry. A team of skillful professionals is appointed by us to carry out business process in an efficient manner. Owing to the dedication, zeal, sincerity and hard work of these professionals, we have been able to achieve stupendous success. The professionals of our firm work in synchronization with the patrons to understand their exact requirements and offer them products accordingly. Apart from this, we organize regular training sessions and workshops to keep our professionals abreast with the advancements in the field of technology.